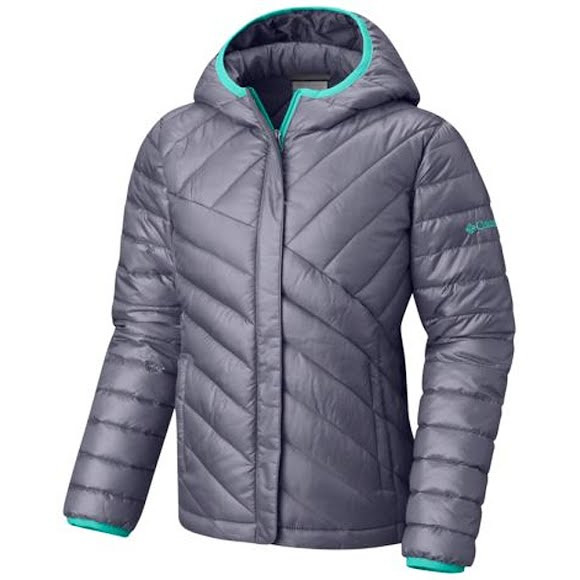 There's nothing like a nice puffy jacket when the mercury plummets, and Columbia had young adventurers in mind when they designed the Powder Lite Puffer jacket with Omni-Shield Advanced Repellency and 150g of faux down insulation that keeps on working even when wet! There&apos;s nothing like a nice puffy jacket when the mercury plummets, and Columbia had young adventurers in mind when they designed the Powder Lite Puffer jacket with Omni-Shield Advanced Repellency and 150g of faux down insulation that keeps on working even when wet! A polyester microfiber that is tightly woven for wind resistance and treated for extreme water repellency. Omni-Shield delivers protection from the outdoors where you least expect it but need it most. This coated fabric resists all liquids below 170 degrees F from absorbing into the yarns and staining the garment (without any effect on the feel of the material). The fabric itself will also dry 3-5 times faster than untreated fabric, without holding moisture like a conventional fabric, meaning it stays lighter even when it&apos;s wet. Advantages of synthetic fill are its ability to maintain insulating properties when wet and that it has less required maintenance than actual down, as well as having the potential to be recycled. sleek and stylish for a toddler, with good quality. the hood stays on head when zipped up enough, even stays often when not zipped so no constant adjusting needed. for very cold weather will need a layer of fleece underneath, but ideal for 3 seasons. I love the lightness and warmth of the jacket. Fits perfectly with a car seat. I would have bought one for a sibling if the size had been available. Very cute! !